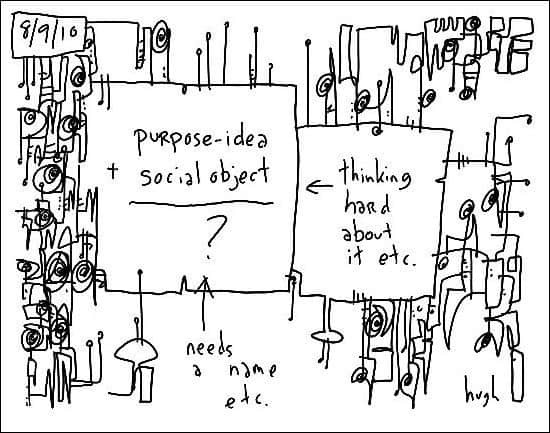 “Purpose Idea” plus “Social Object” equals…???? [Quoting Mark Earls:] Put really simply, the Purpose-Idea is the “What For?” of a business, or any kind of community. What exists to change (or protect) in the world, why employees get out of bed in the morning, what difference the business seeks to make on behalf of customers and employees and everyone else? BTW this is not “mission, vision, values” territory – it’s about real drives, passions and beliefs. The stuff that men in suits tend to get embarrassed about because it’s personal. But it’s the stuff that makes the difference between success and failure, because this kind of stuff brings folk together in all aspects of human life. In his brilliant book, “Welcome to The Creative Age,” Mark Earls, then one of the top advertising planners in London, coined to term “Purpose-Idea”, as a more interesting, engaging and human term to replace the word, “Brand”. The latter he viewed as an outdated, overused and mostly meaningless concept. Though I loved the book [“Purpose-Idea” is one of the most explosive “A-Ha!” moments I’ve had in my entire career], it soon became apparent to me that a Purpose-Idea doesn’t live in a vacuum. It needs to be articulated via a Social Object, so the idea can spread. Ideas spread not on their own steam, but as social objects. “Hey Gang, what do y’all think of this idea” etc etc. The Microsoft Blue Monster was a good example. i.e. “Social Objects that Articulate a Purpose-Idea” etc. So I started drawing Cube Grenades with EXACTLY THAT in mind. But in order to explain what I was talking about, it needed a name. Something more descriptive than say, “Blue Monster” or “Cube Grenade”, terms which are both utterly meaningless without a lot of backstory and context. So recently I’ve been using the term, “Object-Idea”. A bit of a mouthful, maybe, but it works for now. Yes, TV commercials can be social objects [“Dude, did you see that crazy new Progressive Insurance commercial? WTF??!!!”]. In fact, they must be, if the ad is to work. The “Whassuup” campaign for Budweiser [which was actually written by my old advertising buddy, Vinny Warren] didn’t work because the ad was THAT great artistically or convinced you of the beer’s quality. It worked because suddenly millions of young adults the world over started saying “”Whassssuuuup” to each other. The advertising message, “Whassuup” had become a social object. An utterly massive one. In the advertising & marketing world, successful social objects [Often called “virals”, especially when talking online] are a good thing. Every brand manger and his uncle dreams of one day creating the next Cadbury’s Gorilla. But a social object on steroids i.e. an Object-Idea, is far more powerful. Because it’s actually talking about stuff that actually matters to people. It’s not enough for people to like your product. For them to really LOVE it, somehow they’ve got to connect and empathize with the basic, primal human drives that compelled you create your product in the first place. The Purpose. The Idea. Otherwise you’re just one more piece of clutter to them. The Object-Idea might catch on within the advertising & marketing world, it might not. It might need refining on my part- maybe a lot, maybe a little- we’ll see. But I sincerely believe that the people who really get it will have a considerable advantage over their peers who don’t. The Object-Idea. You heard it here first, Folks. Rock on. Very good post! Love the social object and the object idea theory. Hugh – I agree with you that this may be one of your most important posts. I couldn’t agree more that what you put out there has to be driven from your “purpose-idea” if it’s going to help you connect with your community. The best part about this is that once you’ve created that true connection, you suddenly find that you have more freedom about hwo you interact with your community … because your initial contact was made from the “soul” of your purpose-idea, you can now play around, push the boundaries, get really creative with your ideas. You’ve earned the street cred with your audience that gives you that flexibility. … and that’s where you can really start to have some fun! How about Back to Us Marketing? A.K.A., “close that Facebook account” marketing? Why object-idea and not social-purpose? Just wonderin’ since the former seems like such a struggle to birth? It works for business, artists, churches, teams, anything really. Focus on others, connect with others, communicate with others, care about others … you get the idea. Indeed. Every time you get ‘social’ with someone, it needs to be in a way that is in line with their preferences, without being ‘fake’ to yourself. So the ‘social-object’ probably needs to volatile and dynamic. This is why humans will not be replaced by robots anytime too soon. What I get from this at the moment is the getting across the “Yes, this what I’m REALLY like” struggle of a brand and its materialization in an object that carries that instant cred. That object or message or symbol which is instantaneously understood as true, as in “You see it, you get it,” self-evidently. The object is like a punchline, making everyone who got it want to spread it because he thinks it’s cool, but also because he wants to communicate THAT he got the message. Purpose-idea + social object = Totem. Or so. And I second the recommendation of Mark’s book, one of the things that inspired me to get into this business. Hugh – very interesting piece although I must admit I’m struggling with your definition (or maybe just the term) Social Object. Having read your ideas it strikes me that this might be more suitable as Social Potential – and thus the individuals are your “nodes” and their interaction can be measured as potential across the two of the individuals. This is akin to electrodynamics and the base properties of mass and energy. I might be getting a bit carried away here but it seems to follow much more that if brands are able to measure the potential that one node/object will share with the another they can not only predict the effectiveness of the message itself but also the ability for it to become viral and thus achieve KPIs set around distribution and reach (and in turn conversion). This analogy could then go further to bring in the idea of resistance and thus the current (the potential divide by the resistance) can be the new network currency where the resistance is the social network the message needs to overrun? So maybe by tweaking your message to being “You’re in the Social Potential business” could be what you need to take this to the next level? I love Social Object Theory but its been doing the rounds in sociology for several decades I think. I also sign-up to ideas worth talking about are the ones that really connect with people. But whilst no advertising apologist, I’m also aware that peoples’ minds can be changed with a persuasive idea that no-one wants to talk about. In fact I’m sitting here, with some research to hand that proves just that (I.e. No significnt social buzz/sharing of the idea) but plenty of evidence that it changed perceptions. In marketing, there is (still) room for both. Leo, I believe you’re right. Like I’ve said many times on the blog, I first learned of “Social Objects” from my friend, the anthropologist Jyri Engstrom, back when he first talked about it at Reboot Copenhagen back in 2005. “Object-Centered Sociality” and all that. Goes back to Malinowski and “Kula” (The father of modern anthropology) circa World War One. We like to call it social currency. Anything that’s worth an experience out in society. Good conversation, information/insight, utilities all those things have great social value. Find valuable social currency and you’ve struck gold. I like to think about what we are doing today is: Engaging each other with relevant, valuable information. How well we engage our audience, each other plus our credibility and offering will determine the effectiveness or acceptance of our purpose ideas. I think advertising has truly transitioned more towards relevant marketing or “solving needs” — towards solving a real need versus the forever old pushing a product. Value-Object will Engage others. Determine what people value and why and it will be the connector. “Value-Object”. Heh. I like that. Cool watching people coming up with their own terms, based on their own unique language and worldviews. This is a great conversation. In my head, your two-part model is developing a third part. There’s the purpose idea — the brand, that all brand communications and actions should be true to. There’s an insight about what that brand can do in the world to deepen its relationship with consumers — the nexus of brand and consumer and marketplace. And then there’s the creative expression of that — the gorilla, the blue monster — which I guess is what you are calling the object-idea. Before the = would traditionally be the work of the strategist and the object idea would be the work of the creatives. Q: If that price ever goes up, what will it mean? A: That I’m dead. I know it sounds crazy making a big deal about a hot dog, but we spend a lot of time on it. 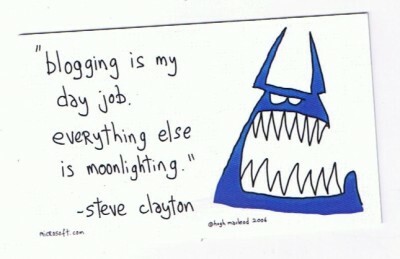 Q: Why is it a big deal for you? A: Because everybody talks about it. We have people who have parties at our hot-dog stands. Guys in Florida get together and have T-shirts that have the Costco hot dog on them. This is a great post about marketing. I’m a student just trying to learn more about this business and I really enjoyed reading your article. Keep up the great work! 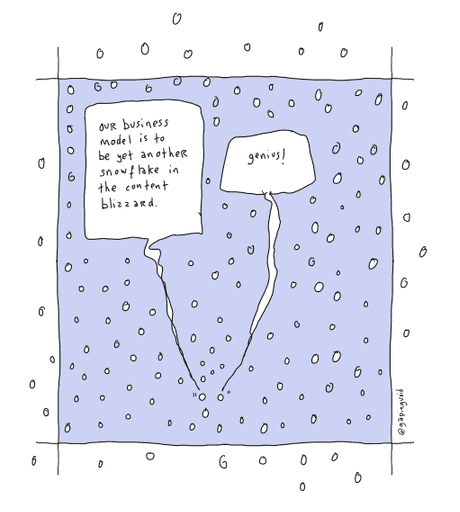 “Guys, you’re no longer in the Message business, you’re in the Social Object business.” – nicely said! Hugh, I’d love to hear your opinion about “context”. Social objects have the potential to trigger conversations indeed, but not all conversations are equal. At least, that’s my opinion. I think that context (the authority of the person who seeds the social object, the culture, the time, the people who participate in the conversation, etc) influences the conversation and implicitly its effects. In general, people tend to learn by watching what everyone else is doing. This behavior entices people to introduce in their conversational context social objects that were successful in other contexts. In the end, they’re disappointed because their conversations – based on that same social object – are not fruitful. Of course, the cause is not the social object in itself but the context in which the social object has been brought into. How can one correlate context and social objects in a way that maximizes results? One approach that came into my mind is to clearly establish the context first and then to surface social objects which are already producing results for the people who share that specific context. From this point of view, the role of a community manager, brand, agency, you name it, would be just to surface the strengths of an already existent conversation and maximize them. I am really curious to know your opinion about this idea and context in general. I’m also interested how you would approach a case when the context does not favor the introduction of a new social object. But IMHO the way brand owners are playing with brands nowadays, it would seem that the current hip ‘brands’ are somewhat ‘purpose-ideas’ themselves..? Love the article and helps me with an issue I’m struggling with which is how to create WOM through ATL campaigns or offline without having to do the Gorilla on it. Any other ideas how to achieve this? I’m most likely missing the point, and in a gigantic way, but I worry that we look at successful campaigns and reverse engineer that ‘success’ and end up drawing the wrong conclusions. Was Gorilla successful? I’m sure it was for Fallon and the thousands of creatives and planners who were ‘there’ when it was invented, but did it sell chocolate bars? Would the bud campaign have worked if they hadn’t been plastering the brand on the superbowl for the last 20 years? I love the idea of social objects, social identity formation and so on. I love the blue monster. I love your art. But can social objects really sell car insurance? I don’t see it.